Have you tried Jones Soda, the AWESOME sub-culture drink? Jones Soda is surely not your everyday commercial soda, it pops and fizzes the way we like it and has the thirst quenching power that fits the X-treme lifestyle. Want to cool your thirst with a new beverage? Tired of the same old boring sodas? Jones Soda is more than cool. It rocks! If you want YOUR FACE on the bottle, get customized Jones Soda! Great for groups, giveaways, and more, there are no limits to what you can place as the label! If you haven't tasted Jones Soda, you are missing out on what defies all other pop cultures as this is for the counter culture (not limited to CounterStrike players). If you surf, skate, dive, or just love to drink something great, this Jones Soda review reveals that is THE drink to choose and it's great for making mixed drinks, too! The wind in your hair and for the speed, you've got to be street smart for that rail in the park or do that downhill. Practicing the kicks might do the trick but when you get on the street, are you the act to beat? Hey, dude, the surf's up! The waves are too high for many but the curl is too irresistible for you and the gang. Are you ready to ride the tide? Band is playing tonight. The girls will all be there. What kind of drink will you hold on stage? What do you drink while watching? One group of rappers over there. You're so cool, you just ignore them. Then, you get an "You're mama..." Are you ready to take on that rap battle? Drink Jones Sugar Free WhoopAss Energy Drink to be ready! Are you drinking what your grandfather does? Would he like to try something new? If he likes to stick to water, make the change to Jones 100% Au Naturel . And, check out the Limited Edition that has Buffy the Vampire Slayer, Dungeons & Dragons, and more. Jones Soda is ideal for people who want to do it their way, the new way, and get to enjoy a drink that is totally delicious. 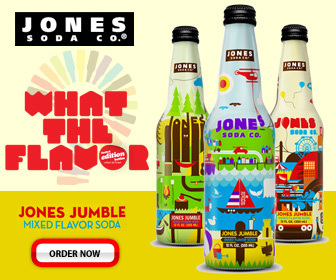 Find out where to buy Jones Soda and have it customized when you click on this review's featured website link. Have you used the Jones Soda? Share your review!